At Data Entry Export, we have a team of experienced expertise who are ready to provide cost effective and perfect output to the clients. We have the consistency to generate accurate 100% customer satisfied output. 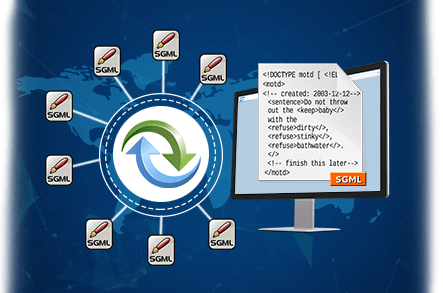 SGML or Standard Generalized Markup Language is a globally sought after standard for defining generalized markup languages for documents. A highly reliable language well-known for its storage, creative, informative, delivery and conversion properties for large data management. It offers data to be converted into various formats according to the client. As a result, there’s an increasing demand for outsourcing this language due to volumetric data flow from global organizations in all sectors. The resources, time and money are some of the factors which are impractical for the big companies to deal with in the long run. So they tend to outsource SGML conversion services which in turn is cost effective, time saving and increases productivity for them. Time and technology are crucial factors for you as well as us. Our teams are well versed and updated on their skills on-the-go according to the new trends making sure you get what you had asked for in performance from us. Data Entry Export makes sure your money, time and resources are put to good use. Drop in a mail or ring us up if you are interested in outsourcing a project with us at info@dataentryexport.com and we’ll make sure your company gets the best out of our team of excellent SGML conversion experts at Data Entry Export.